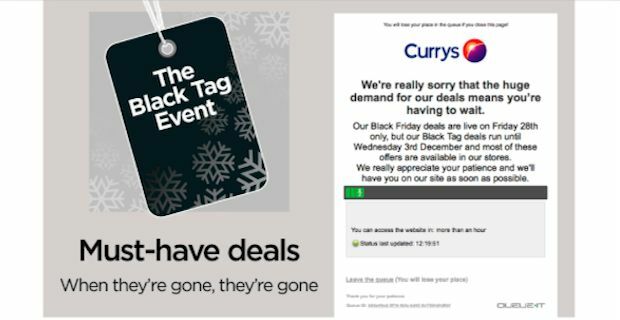 UK customers hoping to avail of amazing Black Friday deals on the Currys website were left disappointed as the number of people on the site caused huge delays for perspective customers logging onto the site. The retailer put a queueing system in place to ensure customers that arrived on the site first were able to get a fair crack at the best deals. The American phenomenon of Black Friday has been creeping into the UK slowly over the past few years. It all started in the States when retailers slashed their prices following Thanksgiving on the final Thursday of every November. The day marks the first day of the sales season and some serious bargains can be found if you are willing to (literally) slug it out with fellow bargain hunters. In keeping with the tradition, Currys are offering some serious discounts on their stock all day today which led to thousands of customers logging onto their website. Upon visiting www.currys.co.uk, beginning late last night, customers were met with a message on that read "Huge demand has meant we need to place you in a short queue." However, many people venting on Twitter demonstrated that the queue was far from short with some customers having to wait more than an hour to access the site. There was also a link if you wanted to leave the queue that was accompanied by a message warning "You will lose your place" if you clicked. A statement from Currys said "Overnight we saw astonishing demand online and implemented a pre-planned queuing system to most fairly support shoppers. We are continuing to implement our queuing system while shoppers take advantage of our great deals online and in-store." Other UK retailers such as Argos, John Lewis, Tesco and Boots were struggling to cope with demand after seeing huge numbers of customers bargain hunting on their websites.